You could rightfully wonder what the intrinsic value of a German dark electro outfit is these days. I honestly haven’t got a clue what the status on the popular demand or lack of same for a band like Project Pitchfork is. Nevertheless, since I’m no spring chick and therefore, like it or not, has the sound of the 1980s and 1990s in my veins for better or for worse, I can’t help finding this new release from Project Pitchfork a bit charming in the sense that the electro beats have their effect and make me think back on this or that club and makes me want to go back there just to check it out again. Am I just saying that this is totally retro? Yes, I suppose I am. Has it got anything to do with metal? No, not really. The imagery of the Germans perhaps has similarities with certain Goth metal units, but soundwise there’s nothing that even hints at metal. Still, an enjoyable however at length slightly repetitious experience that will work nicely if you need something in the background when you cook or whatever. 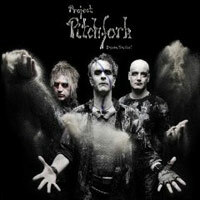 Oh, just one word of warning: Project Pitchfork is not a band that will be remembered for their vocal performance, but the track Full of Life is definitely one to avoid if you have any sense of tune.